Macanta provides a comprehensive portfolio of organisational change services to ensure that your change initiatives are successful. Macanta’s approach to organisational change ensures that change is truly implemented and not just installed. Typical projects end with ‘go-live’ or ‘cutover’, which is installation. This does not deliver the desired benefits. Implementation of change requires a holistic approach that ensures full adoption. It addresses business and human elements so that change is embedded into the fabric of the organisation. Macanta’s organisational change management methodology is called DARE. Realise – selection of practices from the Balanced Diversity framework and implementation of the organizational change management programme including communications plan, sponsor roadmap, coaching plan, resistance management plan, and training plan. Embed – governance, monitoring and tracking of the organisational change programme and allocation of accountability to ensure implementation of the change – not just installation. Most approaches to organisational change apply the same methodology to every type of change. The Macanta DARE approach is different. DARE is a flexible and dynamic approach that ensures that the change programme is customised to the unique needs of each change. DARE‘s utilisation of industry best practices for organisational change, the expertise of our consultants and the unique Balanced Diversity framework provides a winning formula (see below). Make an enquiry about Macanta’s organisational change management services. 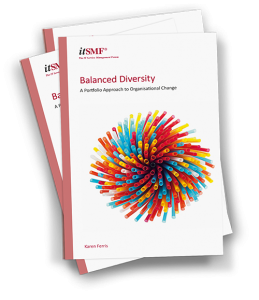 In 2011, Karen Ferris wrote an acclaimed book called “Balanced Diversity – A Portfolio Approach to Organisational Change’ which introduced a new and innovative approach to embedding change into an organisation and most importantly making sure it sticks. The approach uses a framework of 59 practices that are grouped into categories that make business sense. The categories are spread across two dimensions – intent and approach. The intent is what you are trying to achieve and the approach is how you are trying to achieve it. The key to successful organisational change is to select a set of practices from each of the four quadrants of the framework to ensure that there is a balanced yet diverse approach. It is this portfolio approach to organisational change that will make sure the change becomes a part of the fabric of the organisation. The framework can be applied to operational, tactical and strategic changes of all sizes and complexity. If you would like more information regarding the framework you can download Karen Ferris’ white paper in the downloads section. You can also watch Karen presenting the framework in the downloads section. The book can be purchased from Amazon.com and other book retailers. Macanta has embedded the framework into an organisational change methodology called DARE. This ensures that the right practices for the change in hand are chosen from the framework.